My memory might not be so fresh on this KatKat, as I had it several months ago, but I will try to post a short review. The packaging was very pretty and classy, especially the wrapper around the bars (cobalt blue and white). 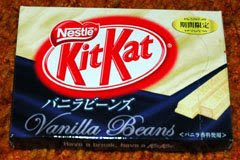 The KitKat itself was a milky white with vanilla bean flecks, and it tasted like a rich vanilla ice cream. Although it seemed a little too sweet, I can't say anything bad about it. I found it to be better than the US white chocolate KitKat (which only seems to come in mini variety packs now) but rather average compared to other KitKats (like Caramel or Cookies and Milk). In any case, I got a bar for some friends at work who had never tried Japanese KitKats before and they loved it. I adore the Cookies & Milk KitKat, why can't we have such yummy flavors here in the US? That is the question, isn't it? I think they had an orange flavor once for a very short time...but I might be mistaken.